In the world of electric motors and power transmission coupling products, torque is increasingly being transferred between directly coupled shafts by means of purely mechanically generated friction rather than by positive drive connections like keys and keyways or splines. Mechanical friction fits evolved into modern standardized dimensions during the twentieth century as machine tools and cutting tooling evolved into their present states of precision and accuracy. 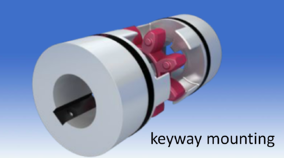 For many decades power transmission component design lagged behind the machining world when it came to the use of mechanically generated frictional clamping, with a large portion of connecting elements still relying on keyways and interference fits to guarantee transmission. Interference fits, wherein the diameter of the male component is actually slightly larger than the diameter of the mating female component, do have their merits when it comes to ensuring reliable backlash free transmission. But they can be difficult to assemble, as the shaft must be cooled with a cryogenic such as liquid nitrogen, or the bore needs to be expanded with heat. If either high heat or extreme cold are used, safety is a key concern during the assembly process. Heating a metal component will also often change its mechanical properties such as temper, so cooling the male fitting part is preferred when maintaining the material properties is a concern. Due to the inconveniences associated with interference fits, most newly designed frictional clamping coupling hubs are made using compression by means of screw thread fasteners instead. This type of mechanical connection is very predictable and can be made by applying a set amount of torque to radial or axial screws. For easy assembly the fit between the male and female part typically should not have overlapping diametrical tolerances, but should also not allow for excessive clearance. When the fits can be made by hand, proper tightening of the fasteners is all that is necessary to create a friction fit which will reliably and predictably transmit torque for the life of the machine. A shrink disk style fit on a female member of a coupling will maintain concentricity and will compensate for tolerances on a male shaft while maintaining the ability to transmit torque across a range of diameter dimensions and torque values. This type of conical clamping hub can be manufactured in different styles to promote modularity, ease of assembly and concentricity between shafts, often allowing for easier balancing for high speed applications. The fastener assisted friction fit has streamlined design of couplings as it allows for the use of smooth shafts which are not subject the imbalance and complications shaft key or spline tolerances can cause. The next time you are sizing and selecting rotating components, consider going with keyless frictional fits and reap the benefits of modern machine construction. When sizing high performance drive components, proper shaft fit is an important consideration in helping to maintain concentricity and balance in the rotating equipment. In v-belt drives, chain drives and other low-cost / low-speed systems, designers often give little thought to shaft fit. Many manufacturers of these types of low cost drive components are simply relying on a shaft key and set screw to transmit torque and retain the hub on the shaft, and other types of misalignment absorbing elements help to take up any eccentricity resulting from a relatively large clearance between the shaft and the bore. But when it comes to high-performance / high-speed drives and “smart” motors, such as servo and steppers, shaft fit becomes increasingly important. When researching a possible vendor for zero backlash components with engineered clamping systems that can be assembled by hand, it is imperative that they are able to provide a shaft tolerance as well as a published chart which verifies the shaft and bore fits required. As a general rule of thumb, the overall diametrical clearance between the shaft and the bore should be around 10-50 µm (.0004-.0019”) for smaller diameter shafts, and as shaft diameters increase beyond 80mm (3.150”), larger clearances become allowable, and more annulus is required around the ID of the bore to ensure easy installation. If the fit is correct, a bit of oil is all that is required to easily slide a hub onto a shaft. Many engineers are inclined to specify interference fits for high performance drives, which in a solid hub design would require either sub-zero cooling of the shaft and / or, more commonly, heating of the bored and keyed hub. This type of fit dates back to times before frictional clamping systems became well established in the power transmission industry, and is intended to eliminate problems associated with loose shaft fits and backlash. Requiring this type of work can create a maintenance and installation problem, and is not necessary in most modern applications incorporating engineered clamping systems. 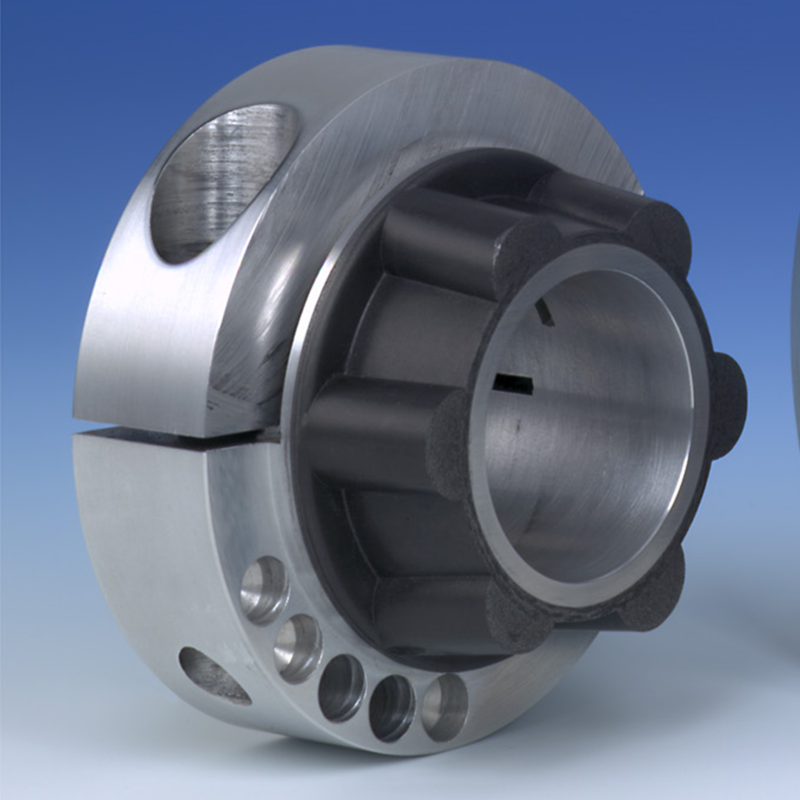 But the importance of precision shaft fit remains when it comes to frictional clamping style hubs. 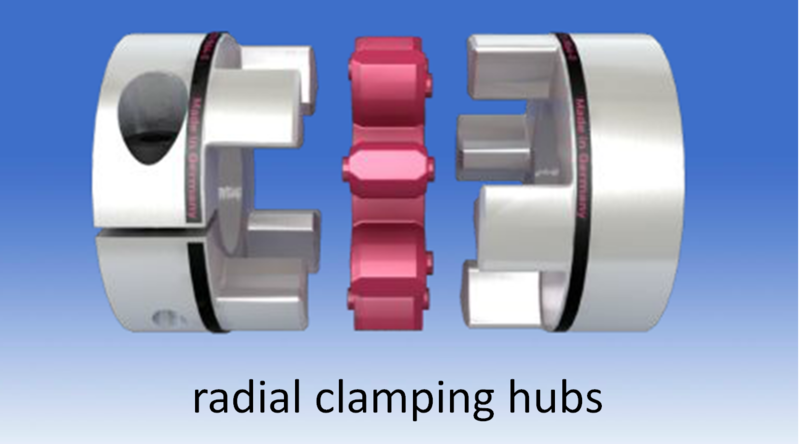 In the case of clamping collarstyle hubs, which offer the advantage of very easy installation and removal, if the fit clearance is too large between the shaft and bore, once clamped, the hub can become eccentric to the shaft. This can cause an imbalance and or misalignment issue in addition to the potential for failure of the driveline. 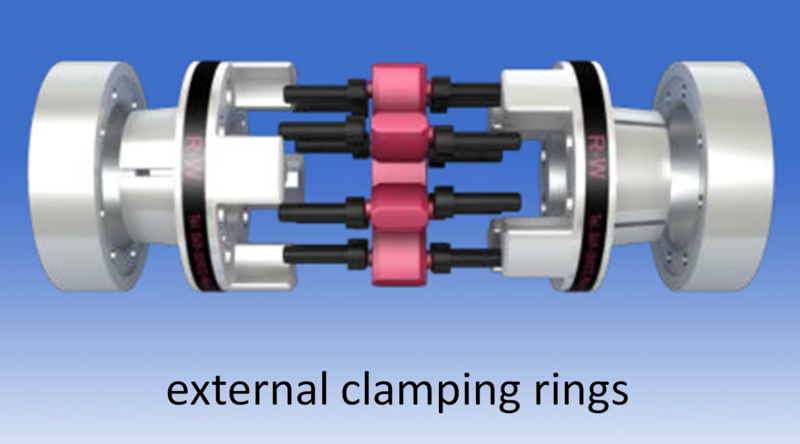 In self centering clamping systems, often used for high speed / high power systems, excessive fit clearance can reduce the transmittable torque of the shaft hub connection. But with proper shaft fits and screw tightening torques applied, they offer superior performance to simple keyway hubs, and far easier handling than interference fit hubs. 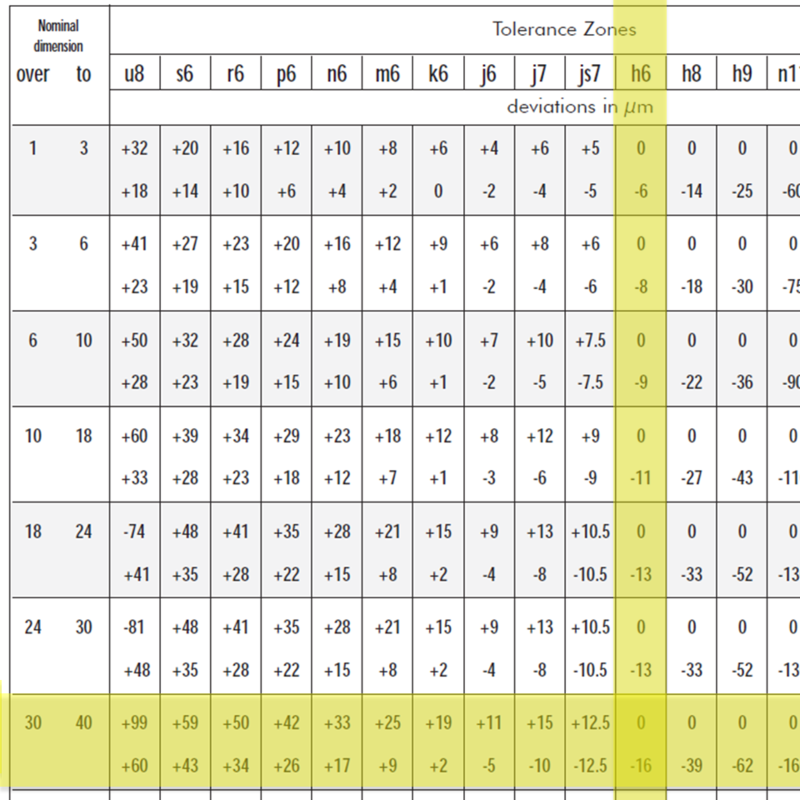 There are several standardized shaft tolerance charts commonly used in industry such as ANSI B4.1-1967 (R2004) for imperial units and ISO tolerance system per DIN 7160 (8.65) for metric units. 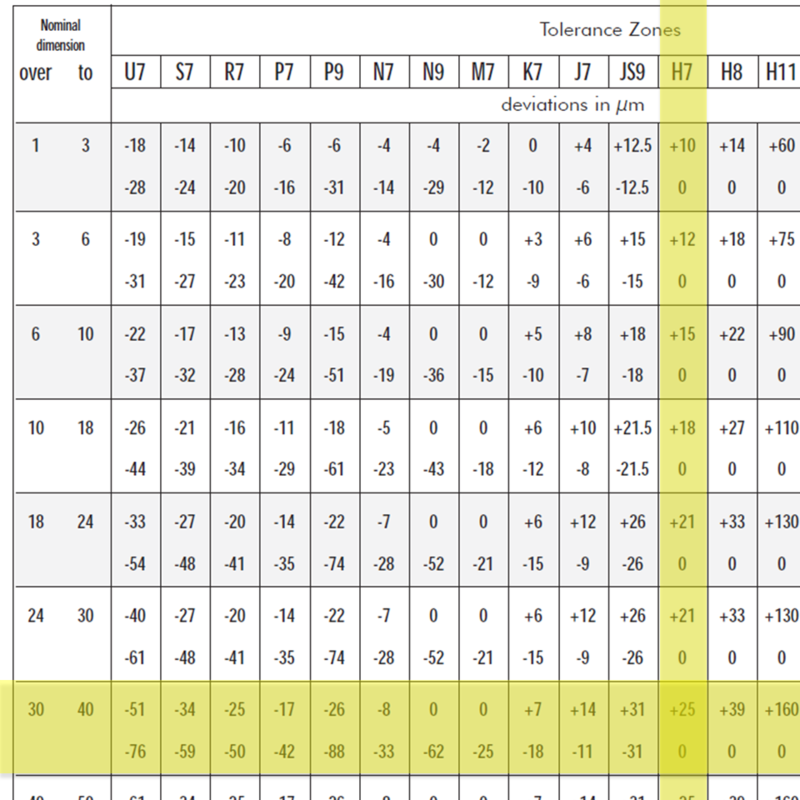 Precision drive components should have a clearance fit which is just out of range of a transition fit such as an H7/h6 fit per DIN 7160 (8.65) chart. For example on a 32 mm diameter shaft, this would mean that the shaft could be 0-16 µm under 32mm. The bore could be 0-25 µm over 32 mm. This would result in a diameter difference of 0-41 µm (.0000-.0016”). If the shaft and bore were both the same size, assembly would be difficult. In practical manufacturing, this would almost never happen. A good machinist would normally use a H7 go/no-go plug gauge and an h6 go/no-go ring gauge. The go portion of the plug gauge would not practically fit into the bore by hand unless the bore was slightly larger than 12 mm exactly. Vice-versa, with the ring gauge and shaft, when checking a turned part with a ring gauge, it would not fit by hand unless the shaft was a bit smaller. If either no-go plug or ring gauge fits, the parts are scrapped. This method of machining/checking shafts and hubs results in parts with a precise fit which can be assembled by hand. 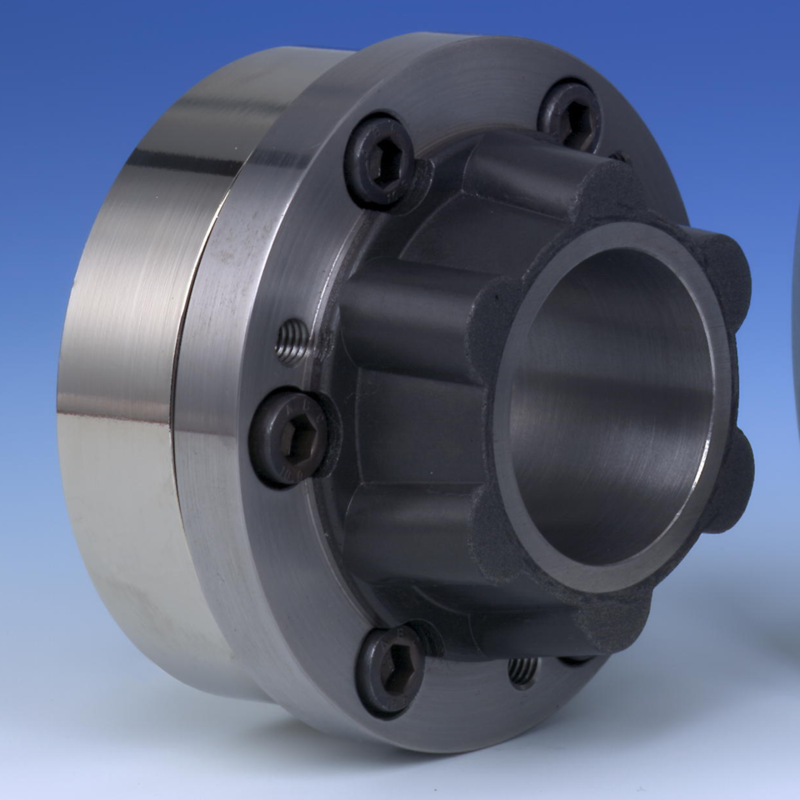 For more information on proper shaft fits and precision couplings for high performance drive applications, contact applications@rw-america.com.